While I am patently aware of the dearth of new content on F for Food, it nonetheless hit me hard to receive an e-mail last week with an offer to buy the blog. Someone clearly took notice of the lack of activity and exhibited interest in taking it over and 're-aliving' it, so to speak. Well folks, F for Food isn't for sale. Even though I have not been able to find the time to put the proverbial pen to paper consistently for over a year, I really, really plan to. I think about it all the time. Not only did this blog keep me relatively sane, relatively grounded, during some very bumpy periods for half of a decade in LA, but it has also been huge part of my identity, my creative outlet, my escape, my happiness and, now, my new career. If you build it, they will come. * Whether you are referring to a ghost to play catch with in a field of dreams or a version of yourself that you are projecting, creating or recreating, I find this mantra, if you will, to be true. Sort of a fake it 'til you make it kind of thing, you know? Upon moving to Richmond I decided a few things. One of them was that I was going to be a Food Stylist to Fred's Food Photographer. Or rather that we already were. So we had cards printed up saying as much. Done. Cut to a few months back, standing in a studio with Fred, each of our assistants, one for styling and one for photography, a production assistant scuttling around, and a cluster of people from The Martin Agency looking over our shoulders as we style and shoot a holiday ad campaign for Oreo Cookie Balls. Surrounded by dozens and dozens of said balls for days with little rest and trying to care for a six week-old baby, you can imagine the slap-happy-terrible-taste ball jokes flying around. And then jump ahead to a week ago: I'm alone – that is, sans Fred, standing in a frozen yogurt shop, after hours, filled with twenty people, cast, crew and clients, along with truckloads of cameras, equipment and gear for a Hamilton Beach blender video shoot. I was The Stylist. In addition to these high falootin' gigs we've kind of become the go-to food photographer/stylist team for our local magazine's food spreads and we even spoke at a local event recently, giving a how-to workshop on food photography and social media. Like, suddenly we're the experts, for crying out loud! So, between all that stuff and our five month-old baby girl, the blog has gotten a little dusty. But not forgotten! 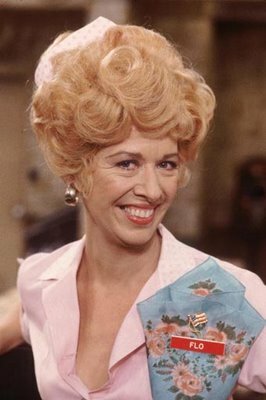 I have been bugging Fred every week about us needing to get new work up here, and we keep saying we will. Life will regulate again at some point – I know it will. Bikes will be ridden. Books will be read. Maybe even a movie. In a theater. A couple of days after the offer-to-buy email, I received an email with an offer to publish sponsored content. Us bloggers receive these with some frequency and with varying degrees of appeal, but this one caught my eye for a number of reasons. First of all, I know and respect the source. Secondly, the company, Rakuten, to be sponsored was new to me and I was pleasantly surprised with its bounty of offerings. Third, the post was to be Thanksgiving-themed. How could this have happened? How could it be this close to Thanksgiving with my hardly given it a thought? I am a food writer! A food stylist! This is the food holiday! Even though I have never had a tradition for this holiday, that is I have never really done the same thing twice, I always host and always cook. A lot. Except this year. This year Fred, Emerson and I will be flying back to LA. On Thanksgiving day no less. I don't know what we will be doing or what we will be eating. I don't even know if Emerson will allow for much anyway, it being her first flight, her first new time zone. At best we will be able to make a humble, yet noble, side dish for the holiday. So we turned to the beautiful new cookbook Heritage from fellow Virginia native, Sean Brock, for inspiration. We didn't have to look far. He had us at Farrotto. To be specific, Farrotto with Acorn Squash and Red Russian Kale. 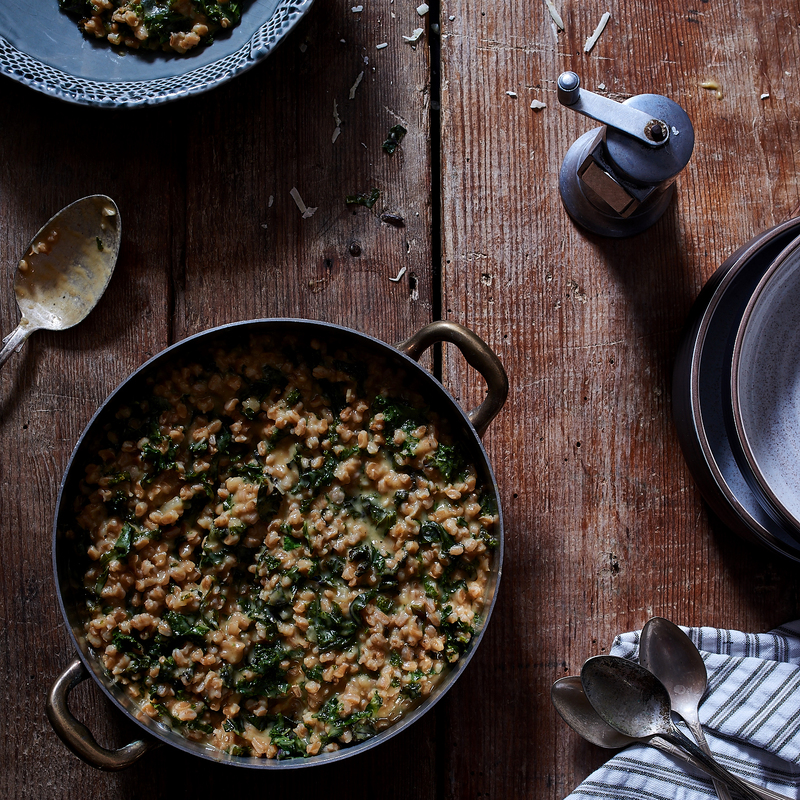 This dish is all kinds of Autumnal, it's healthy and with kale and farro, it's super IN. A perfect winner of a choice for Thanksgiving, if I do say so. In addition to the cookbook, many of the key tools and ingredients for this recipe are found on Rakuten's website. *The original quote from Field of Dreams is "If you build it he will come." Cut the squash in half. Remove and discard the seeds and rinse the squash under cold water. Place the squash cut side up on a rimmed baking sheet. Divide the butter between the two halves and sprinkle with the salt and white pepper. Roast the squash for 35 minutes, or until fork-tender. While the squash is roasting, prepare the kale: Remove the stems and ribs from the leaves. Make stacks of the leaves, roll them into cylinders, and cut them into very thin ribbons. Wash the kale in a sink of cold water, changing it several times, to remove any sand. Drain and dry with paper towels. When the squash is done, remove it from the oven and pour the butter and juices from the cavities into a container. Let the squash cool enough to handle. Warm the stock in a small saucepan over medium-high heat. Add the butter and juices from the cavities of the squash. Peel the squash. Place the pulp in a blender, add the warm stock and juices, and blend on high to a very smooth puree, about 3 minutes. Set aside. Heat the stock in a partially covered large saucepan over medium heat; keep warm over low heat. Heat the canola oil in a medium ovenproof skillet over medium heat. When the oil is shimmering, add the farro and stir to coat it with the oil. Place the skillet in the oven and toast the farro for 8 minutes, stirring after 4 minutes. 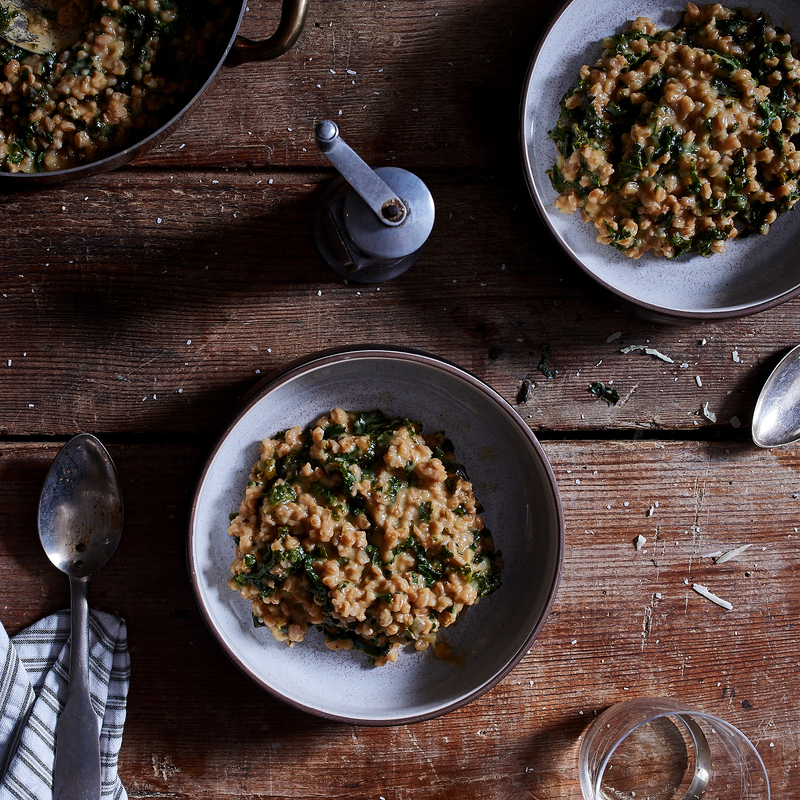 Transfer the farro to a bowl and reserve. Wipe the skillet clean. Put the empty skillet over medium-high heat. When the skillet is hot, about 2 minutes, add 2 tablespoons of the butter and reduce the heat to medium. Add the onion and cook, stirring occasionally, until translucent, about 4 minutes. Add the garlic and cook, stirring constantly, until soft, about 2 minutes. Add the wine, increase the heat to high, and cook until the wine is almost evaporated, about 2 minutes. 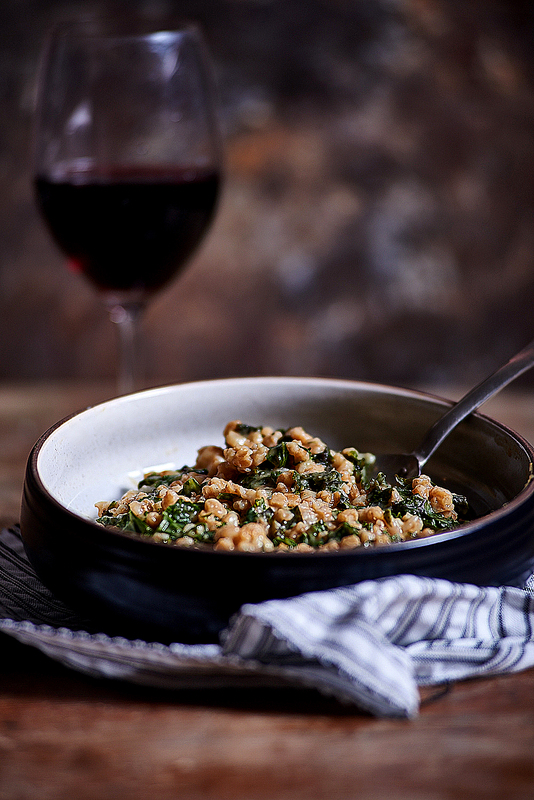 Remove the farro from the heat, add the squash puree and kale, and stir until the kale is wilted. Put the skillet back over medium heat and add the remaining 2 tablespoons of butter and the cheese. Stir and serve.